The UTC Interlogix 2707A-L high security magnetic contacts with armored cable with triple-biased reeds are highly resistant to defeat by external magnets. For added security, magnetic field tamper and pry tamper are standard features. 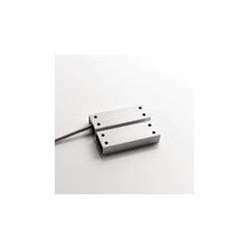 Each 2700 contact and actuation magnet set is factory compensated for the effects of steel. All 2700 Series contacts are accepted by the Defense Intelligence Agency. They are listed in DIAM 50-3 for use in secure compartmented information facilities (SCIFs). 2700 Series High Security magnetic contacts are UL listed. The unit features an SPDT switch, a 3/16" to 5/8" gap size and a 3 foot stainless steel armored cable.